Fabrics: Ann gave me some extra blocks that were already sewed into 4-patches. 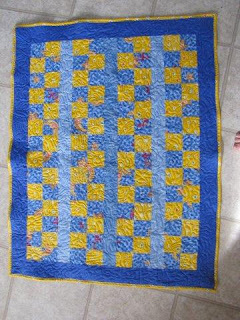 The blues were from my scraps. Thoughts: This is the first quilt I ever tied to machine quilt and I am so excited by it. For a first attempt, I was completely stoked. I knew I'd be doing it again! This went to Christian, a baby at our church.